When you head out to the Ace 2017 Spring Convention & Exhibits, don’t forget your Passport for Prizes. Collect all of our Ace passport stamps, and try your luck at a share of $25,000 in prizes! Eighty lucky winners will receive a $250 gift card. Drawings will begin at random on March 17, the second day of the show, so it pays to enter early. Everyone who completes a passport also is eligible for our HUGE grand prize drawing on day three, March 18, where we’ll be giving away one $5,000 store credit! Look for your card in the initial show mailing that includes your badge and registration materials. 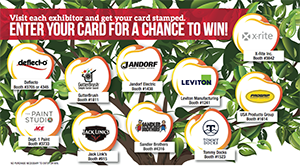 When you hit the exhibit floor in Atlanta, take a trip to all 10 participating vendor booths listed below and get your passport stamped at each one to be entered to win. Extra passports will be available at the Welcome Booth. Fill out and submit your Passports for Prizes by Saturday, March 18 at 3 p.m. to be entered for the grand prize. Limit one entry per Ace retailer. Don’t miss your chance to win! Register now for the Spring show. Friday, March 10 is the deadline to order badges and pick them up on site, as well as book housing, sign up for Pre-Show Training and purchase event tickets, based on availability.